The last two but the upcoming model year as well are extensively used for introduction of redesigned and upgraded pickup trucks including all subclasses. Nissan also follows the same path and the current model year introduced Titan XD model which will be followed with all new 2017 Nissan Titan version. The XD is technically heavy-duty truck considering its gross weight which exceeds 8,500 pounds. However it actually slots below the traditional heavy-pickups while it is above light-duty versions with more towing and hauling capability but not closely enough to target some Super Duty trucks. On the other hand upcoming 2017 Titan model is “half tone” light duty full-size truck which will be more maneuverable and putted in the heart of the full-size class while Titan XD tries to provide solution for those who need truck stronger than lite-duty versions such as Ram 1500 and Ford F-150 but not expensive and capable as super duty models. These models will share almost the same exterior design and they also will go in five trim levels. On the other hand under the skin, these models are different stories and their frames and suspensions don’t share even a single bolt. Another difference is that standard Titan will not offer diesel powered engine like XD model. However, these trucks might prove themselves as great tactical move because with these two models Nissan covers large piece of the entire full-size truck market. In the engine bay, the Nissan will offer three options for these models. Starting from the all new standard 2017 Nissan Titan model it is known so far that on this model the base engine will be V-6 unit but Nissan hasn’t said more about its specification. An optional mill under the hood of this model will be familiar gasoline powered displacement which is also available on the Titan XD model but also on the new Nissan Armada and Infiniti QX80. This a 5.6 liter Endurance V-8 engine is all aluminum constructed machine, naturally aspirated and direct injected. It also features Variable valve event and lift technology. It is rated at 390 Hp and peak torque at 401 lb-ft. This engine is combined with a seven speed automatic transmission and available with either rear- or all-wheel drive. What standard Titan model won’t offer but it is optional on larger XD is a 5.6 liter turbodiesel V-8 engine sourced from Cummins. It makes 310 hp at 3,200 rpm and hits torque of 555 lb-ft at 1,600 rpm. This engine is backed by heavy-duty Aisin six-speed auto shifter. Nisan hasn’t published fuel economy ratings for V-6 and V-8 engines in case of standard Titan version while heavy-duty trucks like Titan XD are excluded from EPA’s tests and so we also don’t know diesel powertrain’s fuel efficiency. What is also important for trucks is how much they can carry and tow and these numbers for new Titan model haven’t been disclosed yet but with V-8 engine this model is expected to tow up to 10,000 pounds. However in case of the XD badged model with gasoline engine it tops 2,594 pounds of payload and most capable configuration also allows up to 11,270 pounds of towing capacity. When equipped with diesel engine, the peak towing is 12,314 pounds and it can carry up to 2,091 pounds. Underneath, the Titan XD is fully boxed ladder frame and it also feature beefed suspension with rear leaf springs and twin-tube shocks setup. It also exploits American Axle differential and of course locking rear differential is available. This model also has much larger disk brakes than smaller version and recirculating-ball steering is also used on this version. Design wise, both models are very similar and main difference lies in their dimensions. Both models will include chromed mesh grille which is flanked by attractive headlights. Hardly noticeable differences that will be spotted after closer inspection are front tow hooks which are integrated into the bumper opening in case of standard model while XD model holds it under the bumper. The side mirrors are also different and Titan features horizontal mirrors while XD has two section tow design. 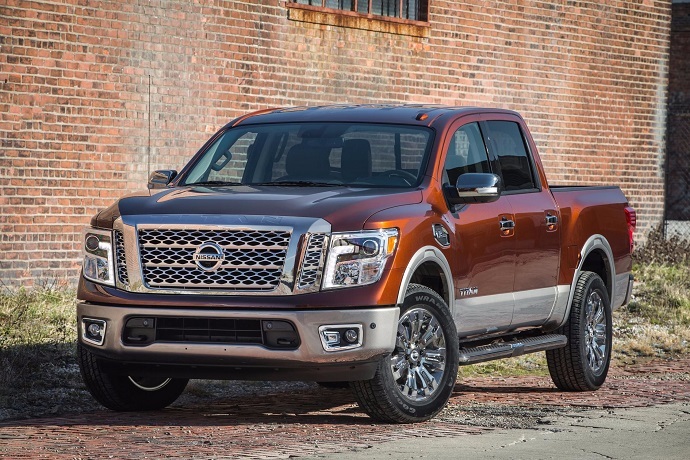 The both models are 75, 9 inches wide but regular 2017 Nissan Titan is 1.5 inch lower in case of Crew Cab version and its wheelbase measures 139, 8 inches while heavy-duty version rides on 151,6 inch wheelbase. Inside, both models share almost identical design. The models feature broad dashboard with nicely arranged center stack. There is situated center screen and large controls that are framed with metallic bezel and pair of air vents. The CrewCab models will have comfortable front seats and equally comfortable rear seats with enough leg and head room. There will also be practical storage compartment positioned under the rear seats and flat floor for load. Both Titan models will be available in three cab designs including Single Cab, King Cab and Crew Cab models. Three bed sizes for Titan model will have 5.5, 6.5 and 8.0 foot in length. The same arrangement will be used for trim levels and models will be offered in S, SV, PRO-4X, SL and Platinum Reserve grades. Options across the available trims will split two models and we don’t possess full specification yet. However, XD model will include tilt and telescopic steering wheel, option for leather upholstery. Available will also be heated and ventilated front seats and heating option will also be offered for the rear seats. A 17-, 18- and 20 inch wheels will be supplied for XD model as well. Nissan’s connect system with smartphone integration, navigation, Rockford Fosgate sound system will come with these models. LED lights, side steps, spray-in bed liner, remote start and many more features will also be in the equipment list of these models but more precise details will be served closer to the release date. For the safety purposes models will include features like rearview camera, parking sensors, blind-spot monitoring, surround view system, etc. The 2017 Nissan Titan will go on sale late this summer. The price is still unknown for both of the models. However, for XD model we expect to be available from around $41,485 which is the starting price of the current version. Roughly estimated price for standard Titan model should start from around $30k.